For detailed instructions on how to measure your horse's hooves for Scoot Boots, see the video and instructions below. Sizing can be tricky so we highly recommend sending your horse's measurements for confirmation of sizing: scroll down for instructions on what photos to send us so that we can help with sizing. 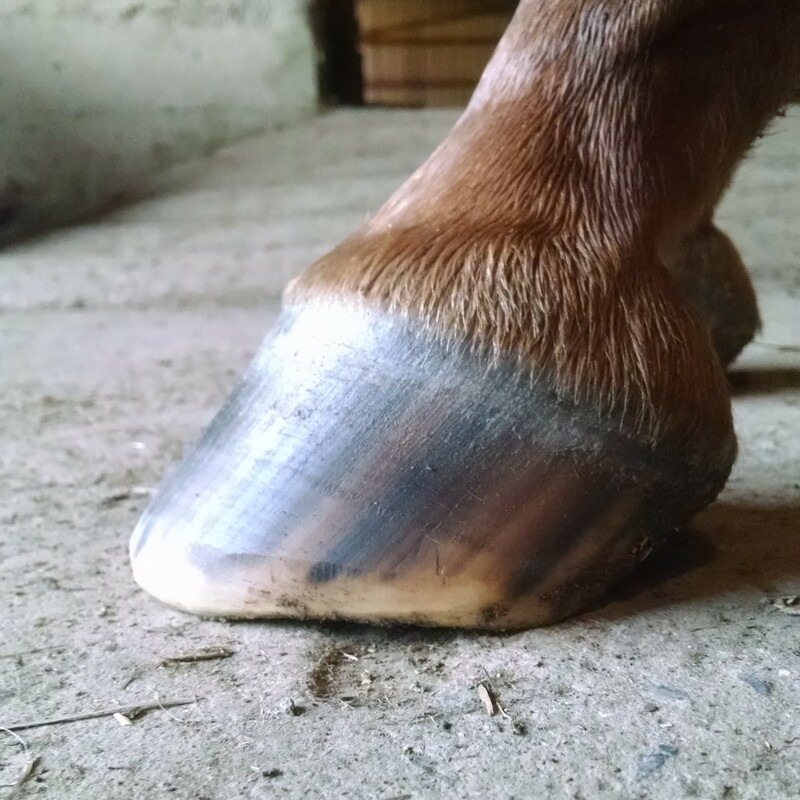 Before measuring, ensure your horse has had a correct barefoot trim (this means a rolled toe with a strong bevel to the wall and no extra length in the toe or heel; sizing will be distorted for hooves not successfully maintained with a natural trim). Measurements must be taken within 2 weeks of a trim. We highly recommend taking measurements in mm but if that's not possible, you can convert measurements taken in inches to mm. Some horses have two different sized hooves so be sure to measure both left and right hooves to see if they are different. Measure length: With a ruler or tape measure, measure the LENGTH from the GREEN line at the tip of the toe to the GREEN line at the rear of the hoof at the very end of the heel buttresses (you're measuring just to the last place that the wall makes full contact with the ground - NOT including where the heels start to slope up towards the heel bulbs as indicated in the red line below). 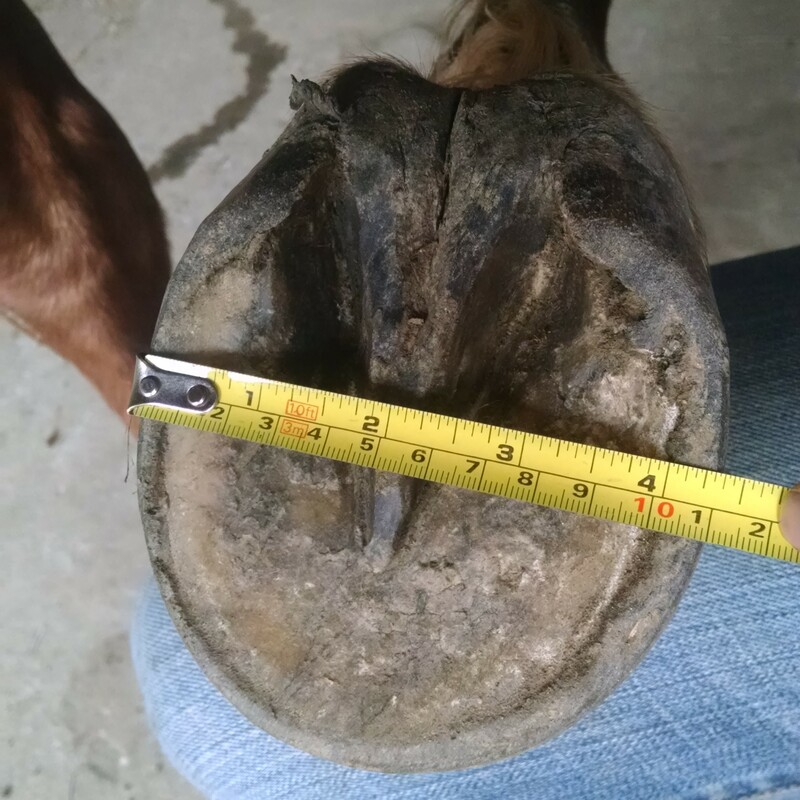 Measure width: Measure the WIDTH of the hoof at the widest part and select the correct WIDTH. Reference the sizing chart: Now that you have the LENGTH and the WIDTH go to our Sizing Chart page and select the right size for your horse (be sure to review our tips for using the sizing chart for selecting the best size for your horse). Length: Start the tape measure at the center of the toe and work backwards over the frog towards the heels, keeping the tape level against the hoof. Do not start at the heels and work forwards! 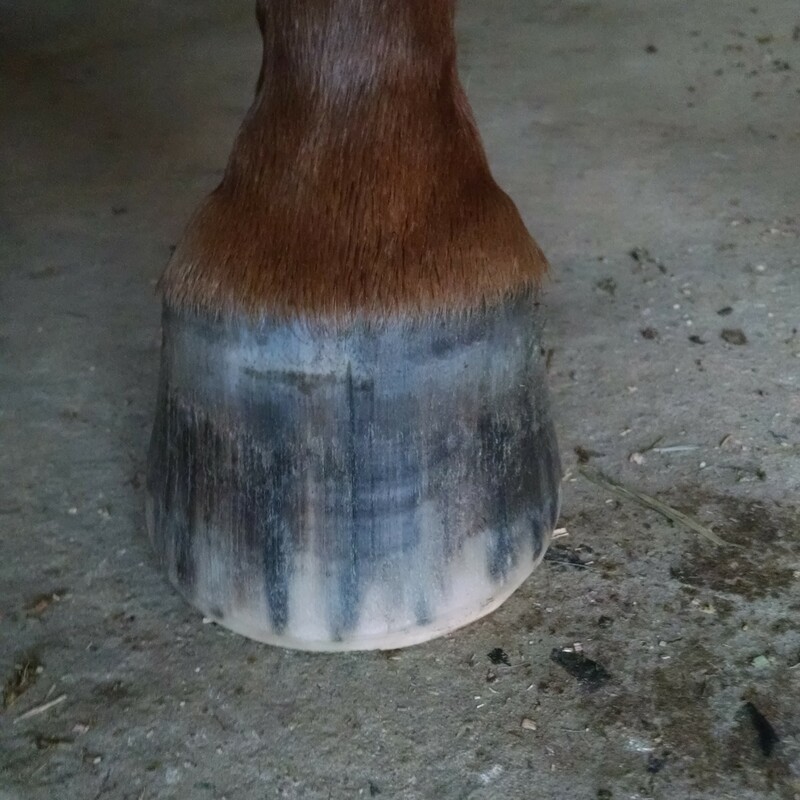 Shape from the front: Shot of the hoof on the ground from the front so that we can see the hoof outline and shape. Shape from the side: Profile shot from the side so that we can see the heel height (should be taken from close to ground-level). NOTE: The measurements in photos must be clearly legible in order for us to offer accurate sizing advice (taking good measurement photos often requires having an extra person to assist). 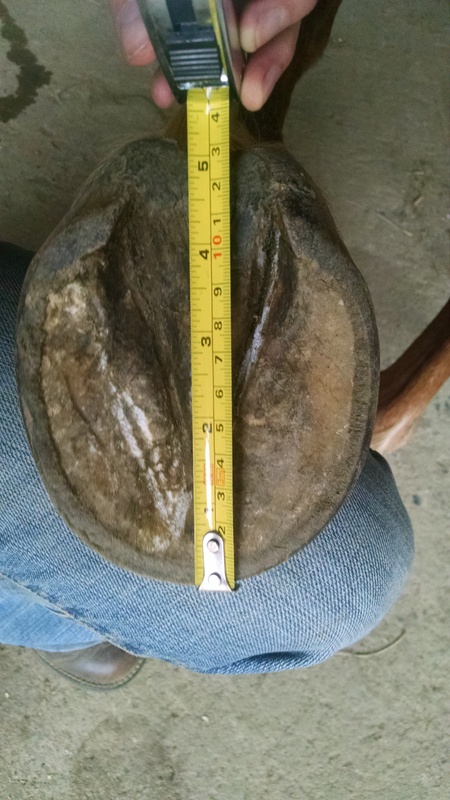 Please verify that the hoof is clean in the measurement photos, the shape photos are taken on hard ground free of debris, and the image quality will allow reading of measurements to the nearest 1/8 of an inch.